A solid-state drive won’t improve the performance you get in games. However, it can greatly improve the speed at which your games load and transition. This is especially true in games with large open worlds. In that case, a SSD can have a huge impact on your gaming computer’s performance and your experience overall. A few years ago solid state drives came into the market boasting 10 times faster read and write times than traditional hard drives. The only problem? Price. At the time, solid state drives were very costly. Just a few years ago a SATA III solid state drive would have cost you about 10 times what a traditional hard drive would for capacity. Today, this number is more like 4 times (depending on the manufacturer and speed of your SSD). Even if you don’t have enough money to buy a large enough solid state drive for all of your files, I highly recommend you buy one for your operating system and favorite games. Games you aren’t currently playing can be moved to your hard drive. This simple change is the biggest speed boost, in terms of experience, I’ve seen for my overall computing experience in the last decade. So, if you’re thinking about getting a solid state drive, which one would give you the best overall value for the money you have? Below, we’ll go over speed, price, and quality to give you the best option for what you’re looking for. Here’s a table showing speeds, capacity, price, and capacities for a few of our favorite models. Want to know whether it’s worth it or not to go for an NVMe SSD or SATA III solid state drive? See the guide below this table. While your typical SATA III SSD has good speeds, in 2017 these aren’t the fastest available. If you’re looking for speed, you’ll want a SSD that uses PCI Express. NVMe or Non-Volatile Memory Host Controller Interface Specification capitalizes on much lower latency. Overall, this means that NVMe solid state drives can operate at read and write speeds many times greater than your traditional solid state drive. Typical Sata III solid state drives bottleneck at about 600MB/s (550MB/S real world) mainly due to the cables they operate with. NVMe drives, on the other hand, use PCI Express 3.0 x 4. Theoretically, this should allow them to achieve speeds of up to 4GB/s. However, all of this comes at a price. A typical M.2 NVMe solid state drive is a bit more expensive than your average SATA III SSD. Still, prices have been drastically reduced compared to what they were a few years ago. In addition, these solid state drives are more compact and get rid of the hassle of having to use cords. 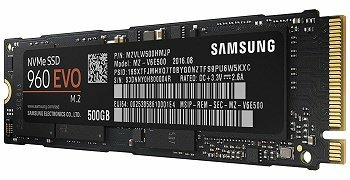 For PCIe NVMe the Samsung 960 EVO is the better overall value for the money you spend. We’re not simply talking about who’s the fastest here. For quality, capacity, value, and speed Samsung are clearly dominating the NVMe space. The same way it’s dominated the AHCI SSD space the last several years. Their 960 series uses PCIe through the compact M.2 form factor. For speed, it’s hard to care about wanting much more than the Samsung 960 Evo. The NVMe interface and Polaris controller give you read speeds of up to 3200 MB/s and write speeds as high as 1900MB/s for the 1TB model and as low as 1,500 MB/s for the 250GB version. This gives you nearly instant loading and boot times. This model is available in 250GB, 500GB, and 1TB capacities. To be able to fully utilize this drive, you’ll need to make sure that your motherboard supports booting from PCIe and has a full speed M.2 slot. Yes, it’s one of the fastest if not the fastest drive on the planet. But, it’s a lot more expensive. That’s because it uses the more expensive MLC V-Nand NAND flash memory vs the Evo’s TLC V-NAND Flash Memory. MLC is faster and more reliable. 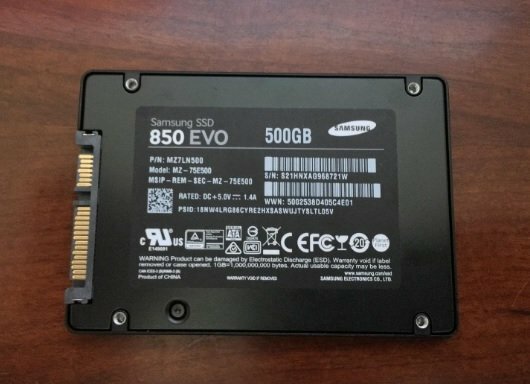 When comparing the Samsung 960 EVO 500GB model to the 960 Pro 512GB model, the difference is around $100 for just about the same capacity. Yes, the Pro is 300MB/s faster on the read and write. However, it’s likely that this performance will go unnoticed by most. Yet, there’s something about having the best NVMe SSD on the market that’s likely to make many pull the trigger, myself included. So, you’ll have to decide whether it’s worth the premium or not. If the traditional SATA III solid state drive is fast enough for you, what’s the best drive to use in terms of capacity and speed? We listed several that we like in the table above. However, here’s a few that really make a lot of sense. I’m not a big brand fan here, so if it were me, I’d go with capacity and value above anything else for these models. I’ve been using this drive in several of my more recent builds. 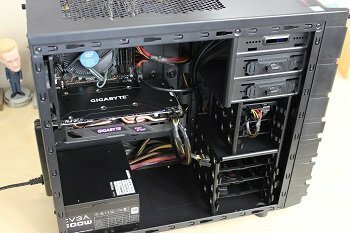 The 240GB version is cheap and works great as a boot solution for a budget gaming computer. Compared to a NVMe solid state drive it’s also about half the price / capacity. As NVMe SSDs gain additional popularity, I think we’ll see that price continue to fall. Drives like this will be used for capacity while the NVMe drives will be used for booting as well as important software. Read and writes for the Premier SP550 are impressive for the money you spend. At 560 read and 510 MB/s write, everything simply seems quicker. Overall, this is one of the better value options on the market and should definitely be considered a top option for those operating on a budget. Kingston’s SSDNow V300 and UV400 are also great options if you’re looking for capacity. The more recent UV400 boasts reada speeds of up to 550 MB/s and read speeds of 490 MB/s. It uses a four-channel Marvel controller to deliver data faster. As far as price, it’s about as cheap as you’ll find for a reliable brand with this kind of speeds. Installing the UV400 or V300 is a great way to get an older machine up and going again. I put one of these in my wife’s laptop that was 4 year’s old. She was asking for a new one. It’s much faster than the day we got it and now she says there’s no need to get a new one. For the last few yearss Samsung has basically owned this market. Rightfully so. There solid state drives are fast, relatively affordable, and very reliable with Samsung’s latest 3D TLC NAND. That same reliability translates into a better warranty for consumers at 5 years with this model and just 3 for the previous 840 Evo model. Even though the Samsung 85o boasts similar read and write speeds to the models above, Samsung can charge a premium for the same capacity. I’m on the fence as to whether or not I think it’s worth it vs the competition. If I’ve got a budget, I’m more likely to go with one of the models above. You’ll have to decide whether you think it’s worth it or not. SATA III vs NVMe SSD – Is it Worth it? So, now that we’ve taken a look at our favorite drives, let’s talk about whether it’s worth it to upgrade to a PCIe NVMe solid state drive vs a SATA III one. First of all there is a significant speed difference when looking at the specs. The AHCI or Advanced Host Controller Interface was optimized to make HDD faster and not solid state drives. Thus it has limitations for SATA III based solid state drives. On the other hand NVMe or the Non-Volatile Memory Host Controller Interface Specification takes advantage of your solid state drive’s ability to read and write lots of things at once by paralyzing instructions. While AHCI can handle 1 que at a time and 32 commands NVMe can handle 65,000 queues of data with 65,000 commands each! Traditional 2.5″ SATA III solid state drives reach up to about 550MB/s reads while the Samsung 960 Pro EVO reaches 3500 MB/s. That’s more than six times the speed. Theoretically the max speeds should reach up to 4GB sequential read and write. Whether you really see a big difference or not truly depends on what you do each day. Most people will see a difference in boot times. Loading up with the 960 Pro takes about 5 seconds compared to around 20 with my previous SATA III SSD. From there, it gets a bit more tricky. First of all, even a SATA III SSD is incredibly fast. For all of my daily PC tasks, it doesn’t seem that big of a deal. For games, I do notice a slight difference in load times. This is a big deal when going online but it’s not the kind of separation we faced like when we switched from a HDD to a SSD. If you transfer a lot of data, then the price is certainly justified. Other than that, you’ll have to determine whether it’s worth it or not. For many, I believe it will. However, if you’ve already got a good system and would have to build a new gaming PC, it could get quite expensive. Alternatives would be to use a M.2 adapter to throw the NVMe SSD in a PCIe 2.0 x 4 or PCIe 3.0 x 4 slot. For those coming from PCIe 2.0 it’s likely you’ll still get above 1100MB/s read and writes. That’s probably twice what you’re getting right now with your current solid state drive. Are you purchasing a PCIe or SATA III SSD?